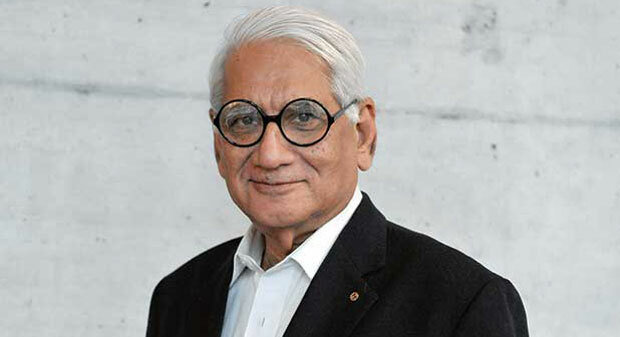 Famous Indian architect Charles Correa was born on September 1, 1930 in Secunderabad, Telangana. This well known architect and urban planner was famous for applying modernist design principles of contemporary times to local climates and building styles. Correa started studying at Saint Xavier’s College at the University of Mumbai, and later he went on to study at the University of Michigan at Ann Arbor (1949–53) and the Massachusetts Institute of Technology (MIT) in Cambridge, Massachusetts (1953–55). In 1958 he came back to India and commenced his practice in Mumbai. The initial works of Charles Correa had a traditional touch in them. He tried to blend local cultural values in architecture. Traditional symmetrical spaces, modernist use of materials, exemplary concrete forms and sensitivity towards site were some major characteristics of his work. He always designed buildings complementing the context and landscapes of India. In 1960s, Correa started paying attention to urban planning as well and formed “New Mumbai” (locally known as Navi Mumbai), which is an urban center catering to two million people across the harbor from the existing outskirts of Mumbai. Unlike many other urban planners, Correa did not go for high rise buildings to solve the housing problems, instead he adopted low-rise solutions and emphasized on human scale. He created spaces in combination with all necessary facilities and generated a sense of community among all his urban projects. Charles Correa has been a great promoter of passive techniques in architecture. He discouraged the use of mechanical methods for heating or cooling the buildings. Instead of active means of air conditioning, Correa preferred smart shading, intelligent use of building orientation, controlled breeze and methods to enhance heat absorption abilities of masonry. He suggested a new living style that he explained as, “using a house in a nomadic way”, that meant using different parts of the house at different times of the day depending upon the passive systems used. These techniques of Correa were not confined to the small scale houses only but he used them for large structures as well including the Gandhi Ashram in Ahmedabad, the British Council in Delhi, and to even high-rise buildings. He introduced courtyards in his high rise residential towers thus providing ideal living conditions at such heights as well. Correa worked under both Indian and international influences. He had great respect and love for his cities and he always wanted them to function with their own essence but in an organized and refined way. He always came up with innovative ideas to improve their strengths as he himself explains it as, “Our cities are among the greatest things that we have; they are part of the wealth of India. They are places of hope. The skills we need are urban skills – we never have to ask the World Bank to send us an expert because our cities already provide them.” However, he always tried to keep his cities from miserable conditions and provide them with paved paths, reasonable living conditions, sense of community, and controlled the increasing growth rate with well proposed urban planning. To make his work more notable in this regard, he founded the Urban Design Research Institute in Mumbai in 1984 to improve deteriorating built environments and living conditions of his fellow countrymen. Thus, his contributions for the low cost shelter and resolving housing issues in third world countries can never be forgotten. Charles Correa died on June 16, 2015 in Mumbai after a brief illness at the age of 84.